One of the best things about K-beauty — besides all the different ways to get your glow on — is that the industry is always evolving. The constant research and innovation it takes to be the best-in-class skincare destination means that South Korean beauty brands are always pushing for professional-grade results derived from the most potent natural ingredients. Which is why you see both men and women in Korea touting flawlessly glowing complexions that make them total #skingoals. This dependable flow of the latest and greatest is what makes us certain that 2018 is going to be another banner year for K-Beauty. We’re only a few months in and already we’ve seen so much cool stuff. Our co-founders Sarah and Christine did some exploring in Seoul to discover which trends and ingredients are set to be the next big thing in beauty. Check out which ones got them excited and find out how to add them to your skincare routine. You can thank Instagram for the current frenzy around highlighters and illuminators — influencers seem to think that if you aren’t glowing bright enough to be seen from space, you’re not doing it right. And while we love a good shimmer powder as much as the next person, we’re pretty psyched to see there’s a new way to get a glow that’s both healthy and more natural. We’re talking about skincare strobing. Yeah, you read that right — K-beauty wants you to ditch chalky powders and pore-clogging liquids in favor of skincare products that create a radiant complexion, no makeup required. How can you achieve this flattering gleam? It’s so simple it’s almost criminal. On days when you want extra radiance, opt for a luminescent serum or ampoule. Look for ones that have powerful active ingredients so you can also treat your skin concerns while you moisturize. The Blithe Gold Apricot Pressed Serum functions as a multitasker that provides nourishment, hydration, and brightening thanks to its 31 percent apricot extract. Another glowy alternative is the Leegeehaam Vita Propolis Ampoule, the OG skincare strober that heals, moisturizes, and refines texture for skin that looks visibly perfected and luminous. It’s made with 50 percent propolis extract that delivers instant radiance and protection, while a 20 percent blend of multivitamins revitalize and strengthen your skin barrier from harmful environmental damage. Centella asiatica and witch hazel extract soothe and minimize pore appearance while also preventing breakouts. All you need is a drop or two on the high points of your cheeks, nose, and any other place you want to add some extra light. Different from skincare as makeup, skincare FOR makeup is made to be worn with your cosmetics, rather than in place of them. We’re talking about next-gen makeup primers that hydrate and protect your skin underneath your favorite powders, lotions, and creams. These moisturizing essences and creams smooth, balance, and brighten, while also providing better color payoff that helps makeup last longer. More of a masker than a primer? Son & Park’s Gesep Preparing Mask is right up your alley. It’s a sheet mask that also functions as a “makeup gripper” with a milky-pearl emulsion that stays on your face when you remove the sheet. Your skin looks and feels plumper and hydrated with an enriching combination of hyaluronic acid and pearl powder, creating the perfect canvas for your makeup artistry and making sure it stays in place wherever the day (or night) takes you. Korean women don’t just do their AM and PM routines and call it quits; they take care of their skin throughout the day. You already put your makeup into a travel bag for touch-ups — why not do the same for your complexion? Whether you prefer a sheet mask, face mist, or peeling pad, your skin can look in tip-top shape no matter where you are. 24/7 skincare takes the famous Korean skin routine to a whole new level. We like the Polatam Pure Cream Mask Hydro Radiance because it provides deep hydration with a cupro fiber sheet mask soaked in a luxe milky essence that’s filled with ceramides, oak sap, green tea, and rosemary extracts. If you can’t steal away for a 10-minute masking session in the office bathroom, Whamisa’s Ausome Mini Hydrating Double Layer Mist is a no-fuss, no-muss option that delivers instant moisture whenever your skin feels parched. Containing 97 percent organic botanicals, this dual-layered mist refreshes and soothes skin with a nourishing aloe vera base, jojoba oil, and apple and tomato extracts. On days when skin looks dull, a gentle peeling pad will serve you much better. Brighten skin tone, smooth out rough texture, and swipe away dead skin cells with the Wish Formula I’m Pro Vitamin C Ampoule Pad, which contains 10 percent free radical fighting vitamin C, as well as healing oils for boosted radiance. For 2018, you’ll see many K-beauty fanatics vying for derm clinic results at home or on-the-go with a handful of nifty devices. 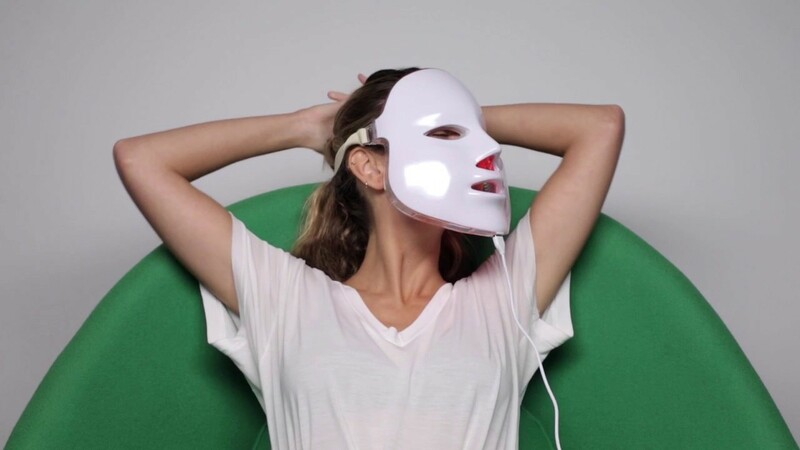 We’ve introduced the WaySkin Skin Analyzer, a great beauty tool that measures your moisture levels and skin age like a much needed hydration coach; however, the gadget that’s expected to make major waves this year is the LED mask. Multiple brands are coming out with their own versions that target skin concerns and provide similar results to what you’d get in a derm clinic. Whether you’re looking to improve acne, fine lines, or pigmentation, there’s an LED mask out there for you. Post-treatment your skin will feel soothed, hydrated, and nourished — like you just got a refreshing facial with the works. The days of sunscreens that make you look like a ghost are finally a thing of the past. Clear formulations are taking the K-beauty scene by storm. Brands are also pumping out double-duty products that are lightweight like essences and ampoules. Because who actually likes that heavy, greasy feeling when applying sunscreen? There are better ways of blocking harmful UV rays. Make P:rem’s sunscreen line has a cult following, thanks to its Blue Ray Sun Gel and Capsule Sun Gel. Both are ultralightweight and smooth textures that absorb into skin instantly without tackiness, much like an essence or serum. And each sun gel formula provides broad spectrum SPF 50+, so you get full protection benefits without compromising on your skincare. The Blue Ray Sun Gel has a more milky consistency, but it goes on clear and cools down skin’s temperature — so you get the added bonus of feeling refreshed in even the hottest temps. You’ll also see a complexion that is more hydrated, soothed, and balanced thanks to nourishing chia seed and centella extracts, plus brightening niacinamide. Make P:rem’s Capsule Sun Gel, on the other hand, has a clear consistency and light fragrance and protects skin from photo-aging. Hydrating botanicals like birch sap, sea buckthorn, ivy leaf, and sunflower seed extracts provide a dewy glow as it protects you from sun damage.